he Bulgari Octo Finissimo Repetition Minutes —Minute Repeater— was first launched in 2016 following the huge success of the Octo Tourbillon Finissimo from 2014 and last year’s Octo Finissimo Automatic. Bvlgari’s mastery of the art of watchmaking was duly acknowledged at last year’s Grand Prix d’Horlogerie de Genève which rewarded both the Octo Finissimo Tourbillon Skeleton and the Octo Finissimo Automatic. With a 40 mm case and an ultra-slim profile with a total thickness of 5.35 mm, comes the new Bulgari Octo Finissimo Skeleton Power Reserve in titanium. Following the success of the Octo Tourbillon Finissimo in 2014, the Octo Finissimo Minute Repeater in 2016 and last year’s Octo Finissimo Automatic, Bvlgari’s mastery of the art of watchmaking was duly acknowledged at last year’s Grand Prix d’Horlogerie de Genève which rewarded both the Octo Finissimo Tourbillon Skeleton and the Octo Finissimo Automatic. The Bulgari Octo Finissimo Skeleton Power Reserve Titanium is an impressive manual wound watch with a level of skeletonization above average. Posted on May 1, 2018 by Editor & Publisher and filed under Bulgari and tagged Bulgari Octo Finissimo Skeleton Power Reserve Titanium Bulgari Skeletonized Watches Mainstream Brands 2018 Most Popular. With a mere total thickness of 3.95 mm, the new Bulgari Octo Finissimo Tourbillon Automatic just released at Baselworld is the world's thinnest self-winding watch. Setting the fourth world record under the Octo Finissimo line, the new Bulgari Octo Finissimo Tourbillon Automatic is simply incredible. The automatic movement equipped with a tourbillon follows the Octo Tourbillon Finissimo in 2014, the Octo Finissimo Minute Repeater in 2016 and last year’s Octo Finissimo Automatic. To the left of the TAG Heuer pavillion as you walk into the exhibition hall, you'll find the Bulgari display. Our favorite piece outside of the new ROMA watch, the Serpenti collection. Spectacular, intriguing and definitely full of bling and flashiness. Just like rolling snake eyes. Posted on April 25, 2013 by Editor & Publisher and filed under Baselworld, Bulgari and tagged Bulgari Serpenti Roma. The new Bulgari Octo launched back in 2012 is clearly a revamped design of the Octo Bi-Retro and Quadri-Retro predecessors. The revamped design is an improvement to the famous Gerald Genta Octo design, with a somewhat thinner, simpler case with finer lines. The result, a stunning watch in every way. Bulgari was founded in Rome in 1884 and acquired by LVMH Group in 2011. While it's more famously known for their jewelry creations, its watchmaking credentials were very well established by the famous Bulgari-Bulgari collection. Subsequently, Bulgari acquired Daniel Roth and Gerald Genta brands in 2000 and along with them, their manufacturing facilities at Saigenlegier, La Chaux-de-Fonds and Le Sentier in the Vallée de Joux. 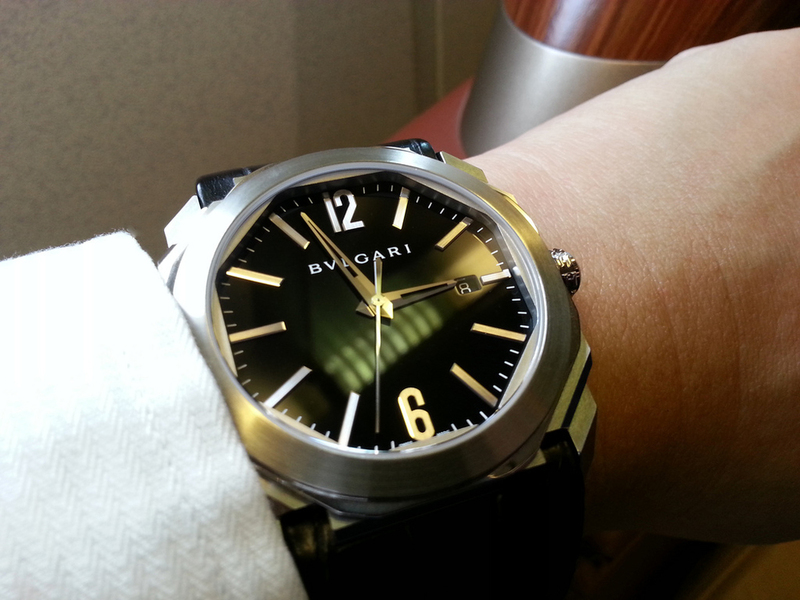 Today, Bulgari relies on their in-house movements to continue to establish their watchmaking credentials. The Octo has a case diameter of 41.5 mm, a thickness of 10.55 mm and it's fitted with a gorgeous black alligator strap and deployment buckle. The Octo derived from the Italian word 'Otto'—meaning eight— was named this way after the octagonal facets of one of the layers in its case that are clearly visible from the side and also in-between the crystal and the dial. The exquisitely designed casing is assembled by hand with a multilayer complex structure of octagons, hexagons, circles, squares and rectangles. There are a total of 110 facets just on the casing alone with alternating brushed and polished surfaces. The bezel has such an exquisite brushed finish that it almost resembles the finish of white gold rather than stainless steel. The dial is a black lacquered dial with applied polished large batons and Arabic numerals at 12 and 6 o'clock. The result is a watch that reflects and interacts with light like we have never seen before. No wonder, both laymen watch enthusiasts and seasoned watch collectors have been singing the praises of this watch since its launch. The design is very elegant with phenomenal attention to detail. 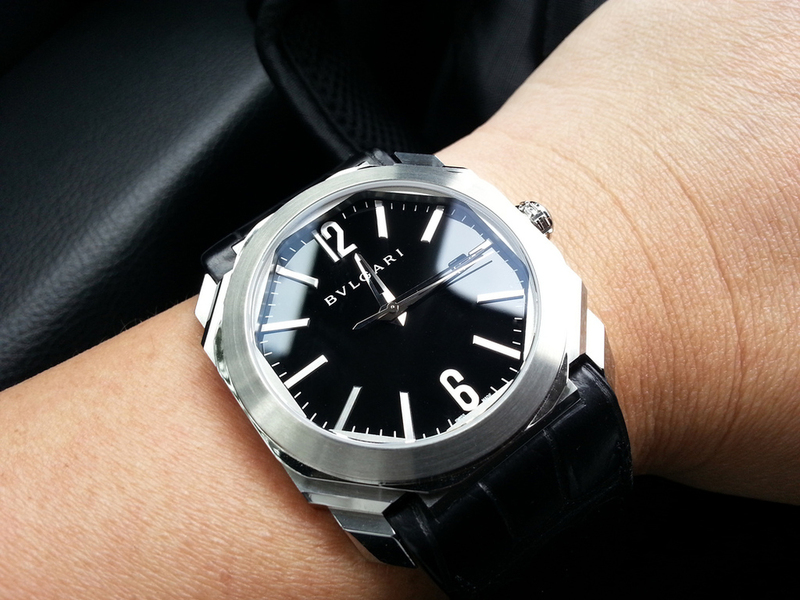 The beating heart of the Octo is the Bulgari in-house caliber BVL193 with a 50-hour power reserve. The beautiful movement can be seen and enjoyed via the display case back. Our watchlifestyler and friend Mr. B, mentions that the watch is very comfortable to wear, and one of his most comfortable watches. The black alligator strap is of excellent quality, supple, well made and well stitched; that is no surprise, as Bulgari is also famous for its well crafted leather goods. What is pleasantly surprising, is that the leather comes in a naturally bent shape so that it wraps around the wrist right out of the box with none of the stiffness that commonly comes with brand new leather straps—no break-in period here. The deployment buckle is also of very high quality and the buckle snaps into position with a satisfyingly loud clicking sound. Some of the drawbacks are the lack of luminous material on hands and markers, size of date aperture and watch packaging. 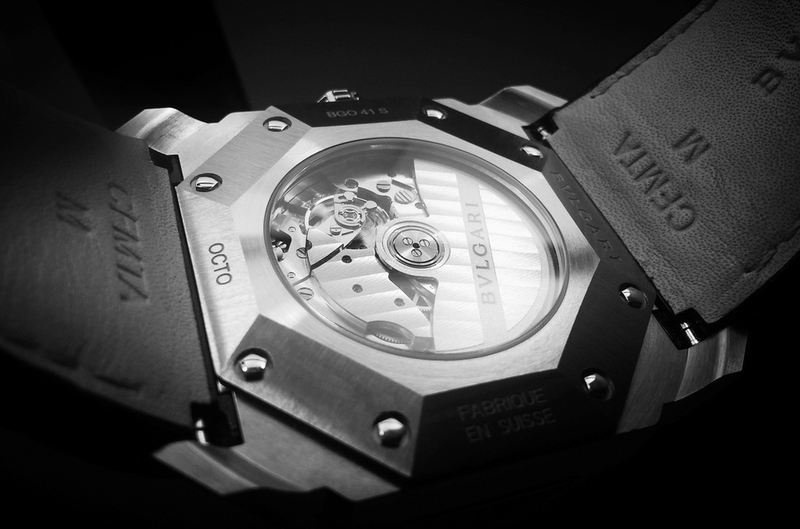 With a depth rating of a 100m, only the careless would take this beautiful alligator strap for a swim. 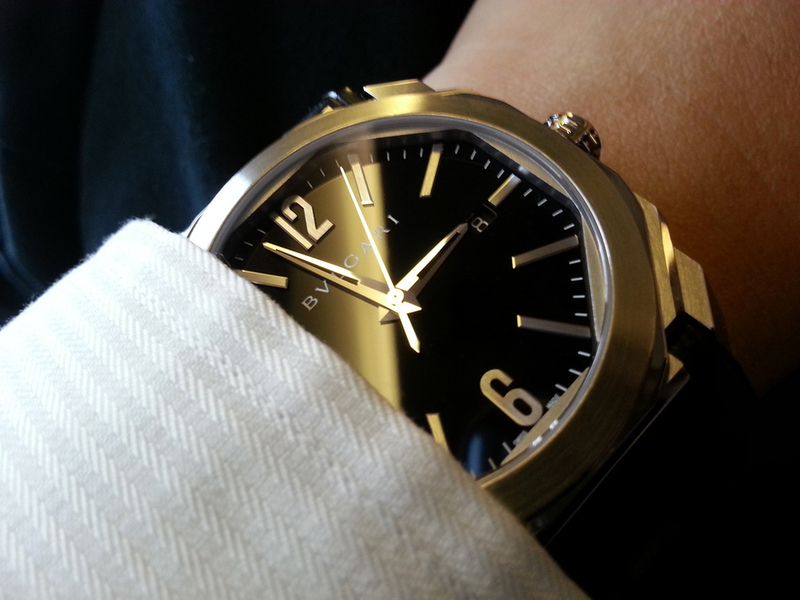 The Octo has a very affordable price for what you get, a perfectly crafted and very comfortable timepiece. Only time will tell if in the far future, if it will be similarly admired as some of the other Genta's creations. This watch is also available in rose gold. Sticker Price for the stainless steel model in this review: $9,500. Posted on April 15, 2013 by Editor & Publisher and filed under Other Brands, Bulgari and tagged Bulgari Octo Gerald Genta Bi-Retro Quadri-Retro LVMH Group Bulgari Posts 2013.